A niddy noddy is a tool used to wind yarn into a skein while simulatneously measuring the length of the skein. Niddy noddies are available in many different sizes - from 12 inches to 4 feet. The most common size of niddy noddy makes a two yard skein. To calculate the yardage of a skein, multiply the number of yarn wraps in the skein by the length of one wrap. 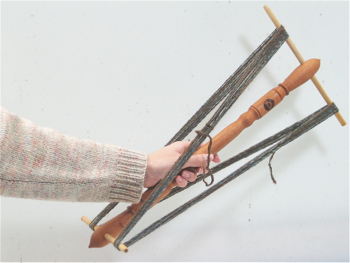 Though niddy noddies are most often used by handspinners, they are indespensible gadgets for anyone who uses yarn. To skein yarn using your niddy noddy, begin by holding the niddy noddy by the center post with your left hand. Secure the end of the yarn with your left thumb and wrap the yarn over the upper right arm (1). Next, bring the yarn down and around the bottom arm that is away from your body (2), and back up and around the upper left arm (3). Then, bring the yarn back down and around the bottom arm that is next to your body (4). Repeat this sequence until you run out of yarn. After a few skeins, the winding motion will become second-nature. 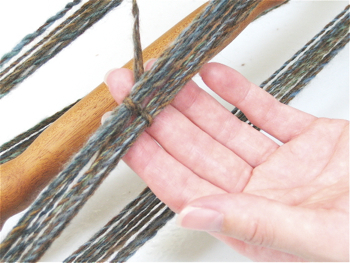 Once you have finished skeining the yarn, secure both ends. Removing yarn from the niddy noddy incorrectly may cause the arms to break. To correctly remove the skein from the niddy noddy, first slide the yarn toward the center post. Next, gently tap one of the arms on a table or other hard surface to partially remove it from the center post. Alternatively, you may partially remove one of the arms by gently twisting it out of the hole. Once you have partially removed one of the arms, the yarn will easily slide off of the niddy noddy.